Bending is made very easy with an apparatus developed by the American Charles Fox. Its blueprint is available from Luthiers Mercantile International (LMI). Their catalog, which can only be recommended, also includes a detailed description of how to use this side bender. It consists of a form and two steel slats heated by three 150-200-watt light bulbs. The wet guitar side is placed between the steel slats, and the tight curve at the waist is pressed down on the form while its underside is supported by a metal bar. The steel slats are pulled tight towards the form and the heat is left on for about ten minutes. 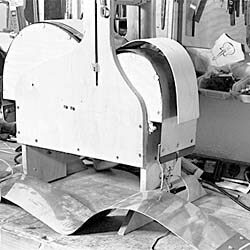 After cooling down the bent side is removed and occasionally touched up on a bending iron. A new version of this bender uses slats made of spring steel, thus eliminating the need for the support bar. Another approach for bending sides is to use a silicone heating blanket on a form. The blanket has to be as wide and as long as the sides of the guitar and it should work with a low voltage. One source for such silicone blankets is Watlow (www.watlow.com), which has branches all over the world.